Oh, my poor brain. Generally speaking, I have a good memory. I remember things visually/aurally more than any other way and once something is in my head it stays there for a very long time. It can make for a great party trick with people I haven't seen for a long time. Unfortunately, parenthood (probably long term sleep deprivation) and age have wreaked havoc on my short term memory, especially for names. It's embarrassing and I've gotten into the habit of just apologizing to people ahead of time. Among software people, I will just shyly admit that my name cache has been flushed. That's good for a few yucks. This damage is part of the reason why I try to sit up and pay attention when I talk to other parents of older children with Down syndrome who are talking about their current issues. Down syndrome is a staircase condition. If 100 people fall down the same staircase, you'll have a bunch of similar injuries, but not 100 identical issues. Still, there may be a lot og common threads and if you don't listen then you may not benefit from the wisdom and experience of others. This is importance of being part of the community. 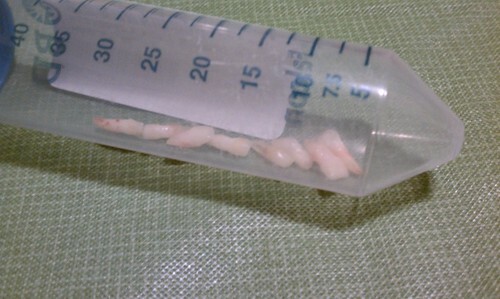 These are eight of Alice's baby teeth, a few hours after having been extracted. Eight teeth? Really? In one of the reference books we have for Down syndrome, there is a note about teeth, to the effect that they come in "late and in unusual order." This single sentence doesn't bear a lot of meaning until your child is 2 and has no teeth. At that time, I remember being at a DS resource group picnic and talking to a mother about her daughter who was in second grade and noted that her daughter's adult teeth were coming in, but the baby teeth were still there. Color me unsurprised when the same happened to Alice. We prodded her dentist about it when her first adult incisor came in behind the baby one, but got a "wait and see" response. A year later they pulled them. Oddly enough, the same parent, at the same time, told us about how her daughter had developed a habit of "eloping", where in the early hours of the morning, she left the house and took a walk on her own. Not too long ago, Alice got up one morning, put on her bedroom slippers, grabbed an umbrella (it was sunny), left the house and crossed our very busy street and started going for a walk. One of our neighbors brought her back. Our solutions to this: a lock on the door she can't reach; a lot of talking about how running away is not OK; dog tags with contact information that she wears; and a stop by the police department with pictures and information. So if you're a parent of a baby/infant/toddler with Down syndrome - this is just a word to the wise.